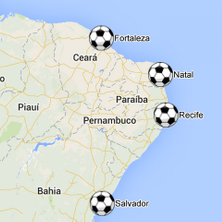 In two months, hundreds of thousands of people will be flocking to cities all over Brazil for the 20th FIFA World Cup. Since getting around in an unfamiliar metropolis can be a bit of a hassle (looking at you, Barcelona), Google has expanded its public transit information for the relevant Brazilian cities. When World Cup fans get to Brazil, they'll be able to look up bus and train info for all twelve cities with scheduled games. The news came from Google's official Maps Twitter account, and presumably Brazilians will start seeing the benefit of transit maps and schedules today. Though Google's transit information is nearly ubiquitous in the US and Canada, international availability is spotty at best. Australia and India have pretty good coverage, as do Denmark and Ireland, but Norway, Tunisia, Egypt, and South Africa only have a few cities each, and the rest of the world just has to do without. Since one of the biggest benefits of having on-demand info for travelers is the fact that it's on their device in their language, bumping up the location support would be welcome. Still, if you're going to do selective expansion, the World Cup is a good place to start.